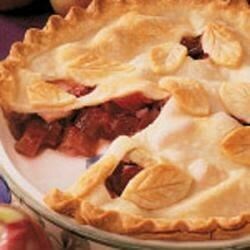 "This recipe originated with my grandmother, who baked many different rhubarb desserts. This was always a favorite of mine." In a large bowl, combine flour and salt. Cut in shortening until mixture resembles coarse crumbs. Combine the water, egg and vinegar; stir into flour mixture until a ball forms. Divide dough in half. Roll out one portion on a lightly floured surface; transfer to a 9-in. pie plate. Trim pastry even with edge. In a large bowl, combine the rhubarb, apples, pineapple, honey and lemon juice. Combine sugar and flour; add to rhubarb mixture. Pour into crust. Dot with butter. Roll out remaining pastry to fit top of pie. Place over filling; trim, seal and flute edges. Cut slits in pastry. Bake at 350 degrees F for 1-1/4 hours or until the pastry is golden brown and the apples are tender. I made this recipe with my mom and it turned out delicious! I would make it again several times!!! Thanks for sharing! Oh and I didnt need to change a thing! !